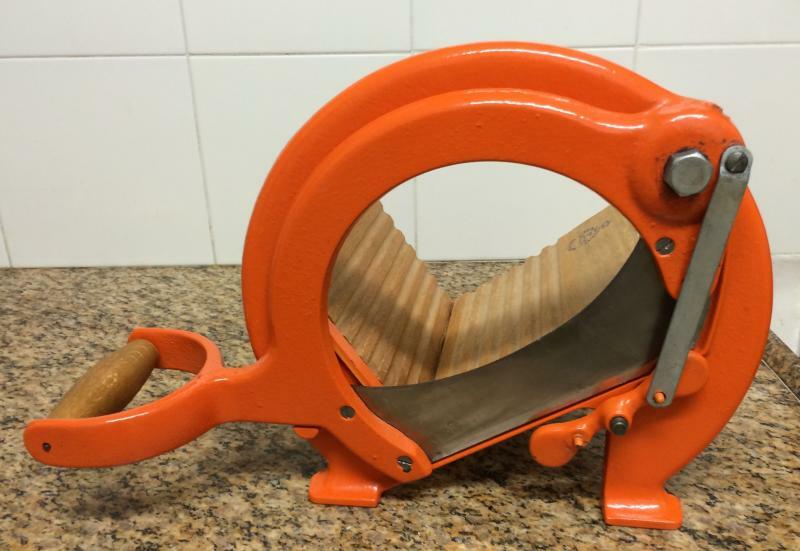 A little over a year ago, I read on this site (here) about PiPs' wonderful find of a Raadvad Danish bread slicer. I saw that post and was filled with envy. Of course, I immediately searched online for one. A few were available on some auction sites, but for very high prices (and most won't ship internationally, either). At work, most people know that I enjoy baking. Of course they know that my favorite thing to bake is bread. I often bring bakes to work. There also happen to be several other hobbyist bakers there, and I often supply them with recipes. After all, I have a rather substantial library of bread books. One guy at work was telling me how he missed good old Russian Rye breads. The next day, I gave him a little bit of sourdough and a recipe. He followed the recipe, made successful bread, and was ecstatic with the result. Fast forward a few months, and he mentioned that his wife found a Danish bread slicer at an antique dealer. Boy was I envious! I told him that I had been wanting one, and that he is very lucky. This was maybe three or four months ago. 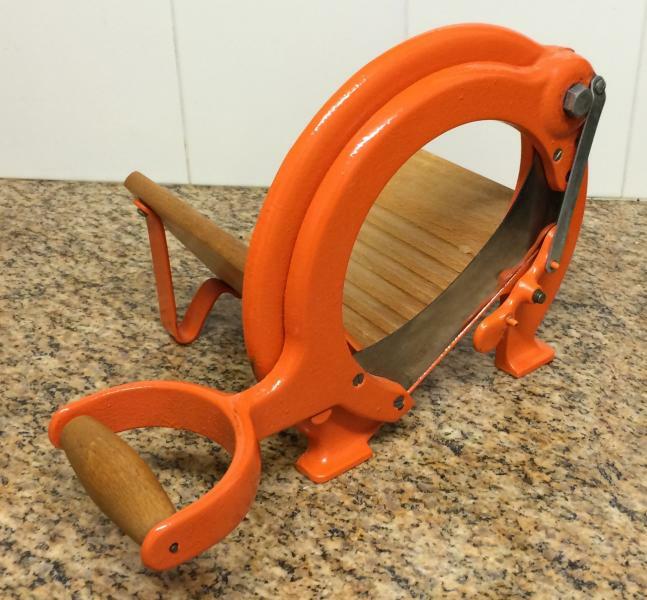 This morning he came to the office carrying a Raadvad Danish bread slicer, in great condition (not as pristine as the one PiPs had bought, but in very good condition, and in perfect working order). His wife had found one, and got it for me! I was elated. I took it home, cleaned it, and sharpened the blade. I now have a loaf of Russian rye bread (Andrew Whitley's version, with a little added salt) baking in the oven. Tomorrow, after it had had time to settle, I will try out my bread slicer. 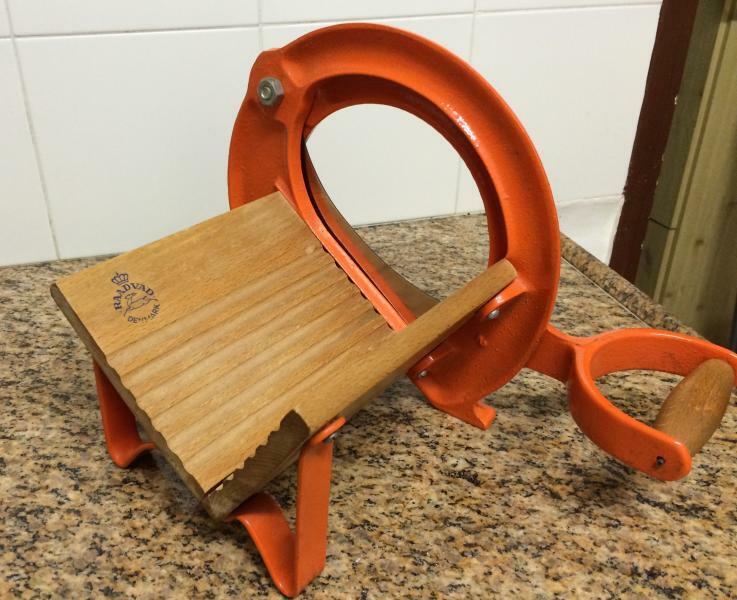 make me sick with your bread slicers - in a good way:-) But especially you with a finely preserved free one as a gift! You are well loved ...now watch those digits!!!! Does it slice round loaves too? That thing looks absolutely diabolical! Not going to be too good for softer breads, I guess? Can anyone suggest a place in the NYC area where I can have my Raadvad blade sharpened??? I would greatly appreciate any suggestions. I'd try Korin...I believe they have a master sharpener on staff. He sharpens knives on waterstones and see no reason he couldn't sharpen your blade--as long as it's removable. Good idea. Hadn't thought of Korin.